Aloha! 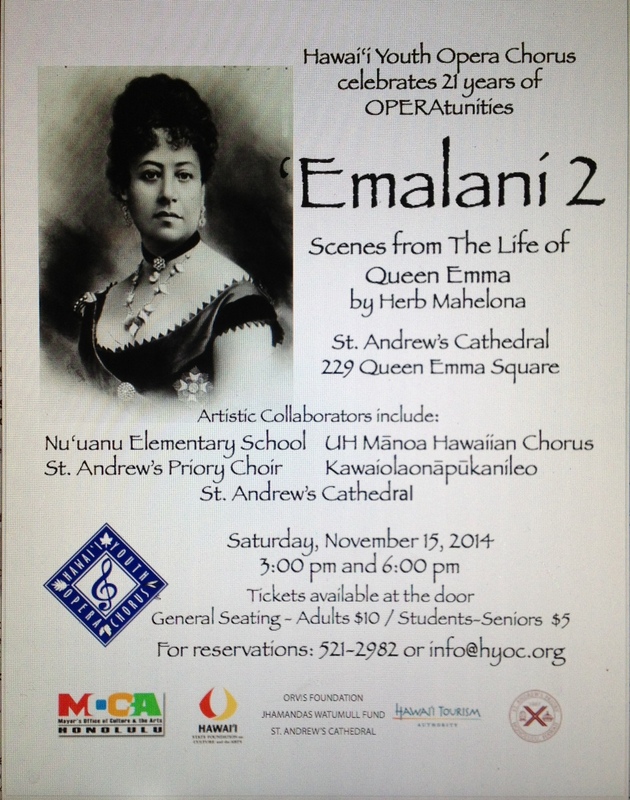 Ticket information is now posted for the premiere of Emalani 2 in Honolulu! It is my first-ever, up-close-and-personal experience with opera. This wonderful work in both Hawaiian and English was composed by Herb Mahelona with the Hawaiian chant text from He Lei No ‘Emalani edited by Puakea Nogelmeier. The opera is about the second half of the life of Hawai‘i’s Queen Emma, her life after the death of her husband Alexander Liholiho (Kamehameha IV) and their son Albert Edward Kauikeaouli. The first part of her life was performed two summers ago in Mahelona’s ‘Emalani. Both operas were commissioned for the Hawaii Youth Opera Chorus. So, it is a youth opera with the principal characters played and sung by talented young people. By serendipity, I am singing in the chorus. You can see in the flyer above the amount of collaboration and support there is for this event. My excitement comes from hearing the music itself and singing it, from reading the book (the lyrics) that is biographical, and from the thrill of realizing what a magnificent and delightful short-hand learning tool opera can be. I am enjoying studying Mahelona’s composition skill and how he structured the music. Hooray for ʻōlelo makuahine and the English translations. I am very thankful for the chance to learn from this type of art. There are rehearsals in music and dance happening all over town right now. ‘Emalani 2 is quite an undertaking. Just one choral practice remains for the group I rehearse with before the combined “tech/dress” in St. Andrews Cathedral on performance day. I heard the cast numbers more than 100, and that the production of 10 scenes will be staged as theater in the round. Can’t wait! Nola A. Nahulu is the artistic director, and Mathias Maas is the stage director. Vision beyond my sight to see each step in thy light. Fill my heart with love ever true, my race to bless, thy will to do. that when my work is done, I will see my husband and my son.